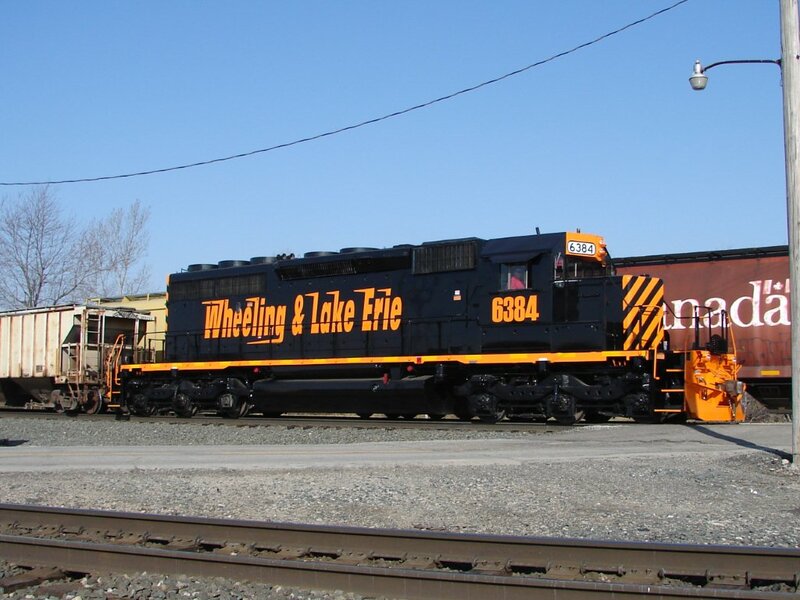 WOW, it’s fresh paint for W&LE #6384, an SD40-2, as I spotted the engine rolling east at Greenwich, OH. Photo by Ken Heyl on 3-29-13. Atlantic magazine recently featured some photos from the on-going LIRR East Side Access Project. JACKSONVILLE, Fla. - March 27, 2013 - CSX is a better, faster and more capable company than it was even one year ago, Michael Ward, the company's chairman, president and chief executive officer wrote to investors in the 2012 Annual Report delivered this week. Last year the company successfully withstood a significant drop in its coal business by making quick adjustments in its operations and focusing on the mainstays of safety, service and productivity. "Experience has shown that when CSX does those things well, we can turn good conditions into great results, or bad conditions into better results," Ward said, noting that employees led the major U.S. freight railroads in safety last year, drove customer satisfaction levels to all-time highs and delivered productivity savings of nearly $200 million. Looking forward, the company believes that its key businesses other than coal will outpace the slow, steady growth that is expected in the economy in 2013, Ward said, and there is little reason the economy cannot gain momentum if Congress is able to pass more meaningful legislation to improve the long-term fiscal outlook and restore confidence. "Our customers across many industries believe that America is primed for real recovery, and so do we," Ward said. - The nation's need for more environmentally friendly transportation solutions. CSX's rail network connects some of the most active economic centers of the world with small farming towns and seaports alike. The company plans to invest in that network at a record $2.3 billion level this year, on top of approximately $8 billion invested in the past four years. Those investments are part of the company's balanced program of capital deployment overall, including dividends and share repurchases. Ward concluded his letter by thanking shareholders for their partnership and belief in the company. "We hope that our quick response to the tough conditions in 2012, and the responsible actions of our 32,000 employees, gave you even more confidence in this team and the investments you have made in the company," he said. Full text of the CSX 2012 Annual Report, including Ward's letter to shareholders, can be found at http://investors.csx.com. This information and other statements by the company may contain forward-looking statements within the meaning of the Private Securities Litigation Reform Act with respect to, among other items: projections and estimates of earnings, revenues, margins, volumes, rates, cost-savings, expenses, taxes, liquidity, capital expenditures, dividends, share repurchases or other financial items, statements of management's plans, strategies and objectives for future operations, and management's expectations as to future performance and operations and the time by which objectives will be achieved, statements concerning proposed new services, and statements regarding future economic, industry or market conditions or performance. Forward-looking statements are typically identified by words or phrases such as "will," "should," "believe," "expect," "anticipate," "project," "estimate," "preliminary" and similar expressions. Forward-looking statements speak only as of the date they are made, and the company undertakes no obligation to update or revise any forward-looking statement. If the company updates any forward-looking statement, no inference should be drawn that the company will make additional updates with respect to that statement or any other forward-looking statements. Note: click on the picture to see it enlarged. Then use your browser's BACK button to return here. Black River & Western RR kicked off its 2013 excursion schedule with the "Easter Bunny Express" on March 23. BR&W's 2102 (ex-NH; SW1200) is seen here leading a four coach consist as it has just departed Flemington (NJ) and heads west to Ringoes (NJ) on its first run of the day. This train will make a total of three round trips on this Saturday, March 24, March 29 and March 30. JACKSONVILLE, Fla., (March 21, 2013) - CSX Corporation (NYSE: CSX) will release first-quarter financial and operating results on Tuesday, April 16, 2013, after the market close. The company will host an earnings conference call at 8:30 am Eastern Time on Wednesday, April 17, 2013 via teleconference and a live audio webcast. NORFOLK, VA. – Coming off its second-best year ever for revenue, operating income, net income, and earnings per share, Norfolk Southern Corporation (NYSE: NSC) is positioned well for growth, and “the future looks good,” CEO Wick Moorman tells stockholders in the 2012 annual report, posted today on the company’s website at www.nscorp.com. “Despite significant challenges in our coal business, we delivered solid results for our shareholders,” Moorman says. “From an operations perspective, the railroad ran extremely well, setting all-time highs for most of our service and velocity metrics. We also continued our strong record of reinvesting in the company, with more than $2.2 billion in capital spending, including completion of some key projects to drive future growth. Norfolk Southern paid tribute to its heritage in 2012 – the company’s 30th anniversary – by painting 20 new locomotives in the color schemes of some of its predecessor companies. “The management teams of our predecessor companies could not have imagined the scope of change that has culminated in today’s Norfolk Southern, and I’m confident that the best years of our company are still ahead,” Moorman said. 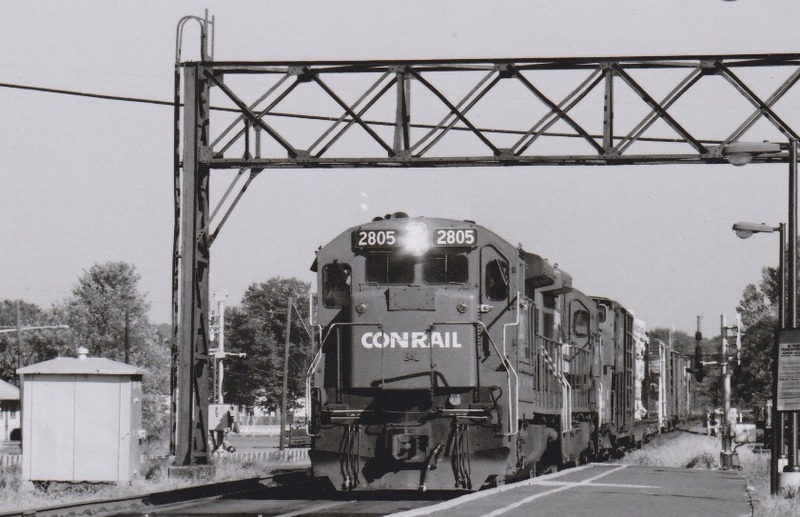 It was a sunny day and the temperature was pushing into the low eighties as CR's WJOI was heading west along NJT's Raritan Valley Line on September 30, 1985. In the lead is CR 2805 (GE B23-7), a second unidentified diesel and followed by its mixed consist of frieght. Back then there were a number of customers along this line that received shipments by rail. That load of lumber, second car back in the consist, might be destined for the lumber company that was located near Glen Gardner. The two signal bridges seen in this photo were in the process of being dismantled. Fast forward to present day Raritan and one can see a number of changes as NJT's train 5521 arrives in the station to let its passengers disembark. As for the freight business along this line, there is only one now. It would be Fisher Scientific which receives two or three tank cars when needed and is located about two miles west of this location. JACKSONVILLE, Fla. - March 19, 2013 - CSX today announced the 69 winners of its 19th annual Chemical Safety Excellence Awards, which recognize customers for their commitment to the safe transportation of hazardous materials by rail. Nearly two-thirds of the 2012 recipients are repeat winners, demonstrating continued dedication to safety and a strong partnership with CSX. "I commend all of the recipients for their ongoing dedication to the safe transportation of materials that are critical to businesses and consumers," said Michael J. Ward, CSX's chairman, president and chief executive officer. "Safety is a core value at CSX and we are proud to work with companies that share our commitment." The Chemical Safety Excellence Awards are presented to customers who ship more than 600 carloads of hazardous materials during the year without a release due to factors such as not securing valves or closures properly. CSX and its customers work together to ensure that hazardous materials move in the safest equipment and employees are trained on safe loading and handling procedures. At the awards ceremony, Ward talked about CSX's continued focus on strengthening customer relationships. The event also featured an expo with interactive displays highlighting CSX's safety, training and responsibility programs. Recipients represent a variety of industries such as energy, technology and agriculture. The 2012 winners include: AkzoNobel, Inc.; Arizona Chemical Company; Arrow Reload Systems; Ascend Performance Materials, Inc.; Ashta Chemicals; Aux Sable Liquid Products LP; Axiall Corporation; Buckeye Development & Logistics;� Buffalo Lake Energy Corp.; Cardinal Ethanol LLC; Cargill; Celanese Corporation; Centennial Energy LLC; CF Industries; CHS, Inc.; Citgo Petroleum Corp.; Delaware City Refining Company; Dominion Transmission, Inc.; Dow Corning Corporation; DSM Chemicals North America; E. I. DuPont de Nemours and Company; Eastman Chemical Company; Eco Energy, Inc.; Elementis Chromium LP; ERCO Worldwide; ExxonMobil; Flint Hills Resources, LLC; Granite Falls Energy LLC; Horsehead Corporation; Huntsman International LLC; Husky Marketing & Supply Company; INEOS Nitriles; INEOS Phenol; International Chemical Co.; Kemira Water Solutions; Keyera Partnership; Linde; MarkWest Hydrocarbon; Mercuria Energy Group Ltd.; MHF Services; Military Surface and Deployment Command; Moose Jaw Refinery; Nan Ya Plastics Corporation; NGL Supply Company LTD; NOVA Chemicals; Nucor Corporation; NuStar Asphalt; Odfjell Terminals Houston; Olin ChlorAlkali; Patriot Renewable Fuels LLC; Paulsboro Refining Company; PBF Energy Company; Pembina Resources USA; Phillips 66 Company; Pioneer Trail Energy Corp.; Plains All American Pipeline; Pursue Energy; PVS Chemicals, Inc.; Reagent Chemical; Sabic Americas, Inc.; Shell Chemicals USA; Southwest Iowa Renewable Energy; Styrolution America, LLC; The Dow Chemical Company; The Mosaic Company; Toledo Refining Company; United Refining Company; and Westlake Chemical. For the past two decades CSX has recognized customers who lead the industry in chemical safety. More information on the award, along with a list of recent recipients, can be found online at http://www.csx.com/index.cfm/customers/safety-security/chemical-safety-excellence-award/. CSX, based in Jacksonville, Fla., is one of the nation's leading transportation companies, providing rail, intermodal and rail-to-truck transload services. The company's transportation network spans approximately 21,000 miles, with service to 23 eastern states, the District of Columbia and two Canadian provinces. CSX's network connects more than 240 short line and regional railroads and more than 70 ocean, river, and lake ports. More information about CSX Corporation and its subsidiaries is available at www.csx.com. Like us on Facebook (http://www.facebook.com/OfficialCSX) and follow us on Twitter (http://twitter.com/CSX). That is right 87 years. Road (at the Meadowlands Diner), turn right 2 blocks to the Club. If you know where MetLifeStadium is, we are only half a mile away. Word of Mouth is our Greatest Advertisement. Sponsored by the Winchester (VA) Chapter NRHS and in cooperation with NS, the "Autumn Leaf Special" was run back on October 8 and 9, 1988. It departed from Hagerstown, MD and traveled Luray, VA to "...traverse 90 miles (one way) of scenic countryside and spectacular fall colors via a now freight only line." according to the flyer. One of the cars in this consist was the NS Exhibit Car. Upon its arrival in Luray, passengers had a three hour layover there where they could visit the Page County Heritage Festival. The excursion is seen here departing Luray behind two SD40-2s, NS 3244 and NS 6157. When Dunellen's Railroad Days was held back on September 7 and 8 in 2002, it was billed as a "...celebration of the town's railroading heritage". Part of the festival's activities included train rides over NJT's RVL from Dunellen to North Branch. The excursion is seen here crossing over the Raritan River just east of North Branch (MP 39.4) as it heads back east. Motive power consisted of NYS&W 2402, seen here leading, NYS&W GP20 2064 and NYS&W 2400. Right behind the 2400 was Suzie-Q's dome car. 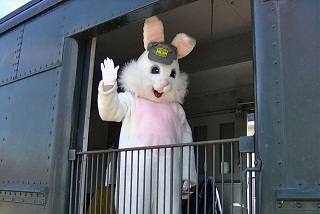 Ride the Easter Bunny Express at the Black River & Western Railroad! Don't miss your chance to meet Peter Cottontail aboard the Black River & Western Railroad! The Easter Bunny Express operates Saturday and Sunday March 23-24 and Friday-Saturday March 29-30. Trains depart Flemington Station at 11:00 AM, 1:00 PM, and 3:00 PM on each day of operation. Tickets are available at the station beginning at approximately 10:30 AM. Reservations are not available for this event. Don't forget to tour our museum car next to Ringoes Station! Also, ask your Conductor to tell you all about our restoration of CNJ Coach #1009! Our volunteers are hard at work restoring this historic coach for service on our passenger trains. 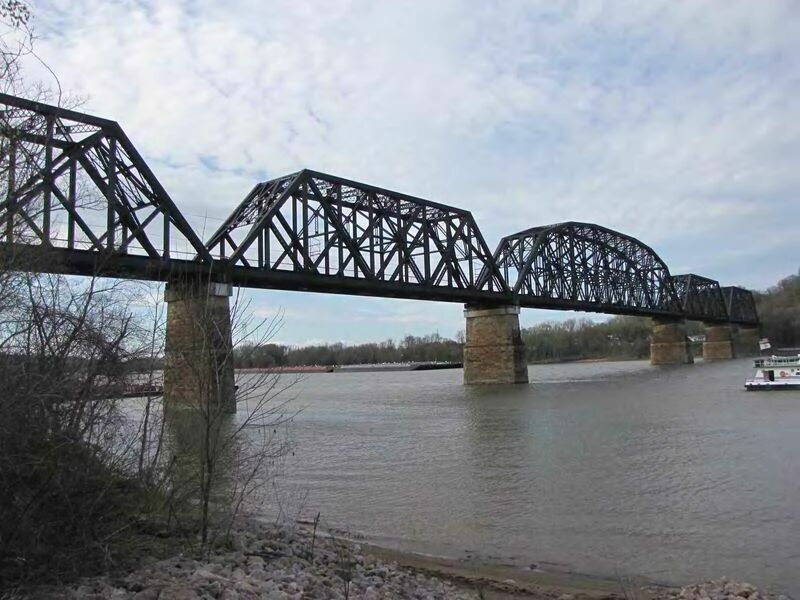 NORFOLK, VA. - Today marks the 100-year anniversary of the completion of the modern version of Norfolk Southern's bridge over the Ohio River between South Point, Ohio, and Kenova, W.Va. - a dependable link in the nation's freight rail transportation infrastructure. "The bridge is crucial to the operations of the Pocahontas Division," added Gary Shepard, NS division superintendent, Bluefield. "It is an example of the type of quality and hard work produced by our valued employees." Although the bridge is 100, its durability is unquestioned. NS bridge forces monitor and maintain it for reliability and safety. "The bridge has undergone major upgrades several times over the past century, and its excellent condition is a reflection of the industry's continual investment - without taxpayer dollars - to give the nation an economic competitive edge," said Jim Carter, NS chief engineer, Atlanta. "Like everything on the railroad, it is well-designed and systematically well-maintained. We fully expect it to be serviceable for another 100 years." 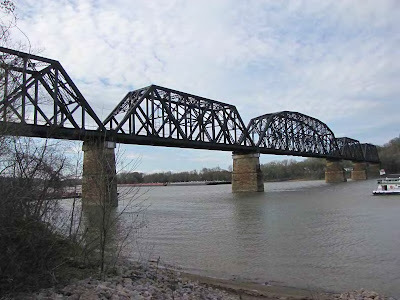 Major river crossings by railroad bridges are relatively few in number across the country. NS' Ohio River bridge is nearly 4,000 feet long and 82 feet above normal water level, and it creates a memorable scene, especially as the early-morning sun reflects downstream. 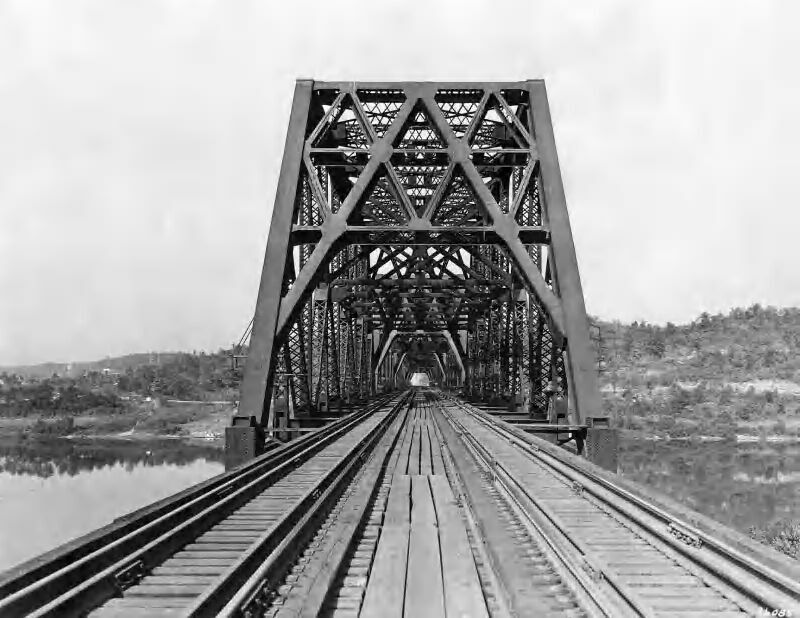 The bridge originally was designed with a single track in 1892 by NS predecessor Norfolk and Western Railway, although it was constructed with piers wide enough to accommodate future double-track. As nearby coal fields developed and the demand for coal in the Midwest grew, traffic increased, meaning more wear and tear. So, N&W rebuilt the bridge with double-track and a stronger overall structure. Updates included pier modifications and new trusses, completed entirely around the existing structure to allow train traffic to continue during construction. It was on March 4, 1913 - 100 years ago - that work crews met in the middle to connect the ends of the main channel truss. The first train crossed the newly completed double-track at 10 a.m., June 9. The bridge was "completely finished" in September, when workers finished painting. "Overall, it was a remarkable achievement under traffic," Carter said. "To read the accounts is a humbling experience." It was the longest structure on the railroad and had taken 21.6 million pounds of steel and $1 million to upgrade. Its importance was not just physical but strategic. As N&W's gateway to the West, the bridge was said to have been one of the Germans' targets on American soil during both World Wars. During WWII, saboteurs were caught nearby, and a Coast Guard unit was detailed to protect it. "Had any of these dastardly efforts come to fruition, it would have impeded the movement of coal, vital war materials, and soldiers traveling to military and manufacturing installations," said Tim Hensley, a noted railway historian who lives within walking distance of the bridge's West Virginia approach. One of the more unusual sights on the bridge occurred Nov. 15, 1967, when the world's longest, heaviest freight train traversed it. 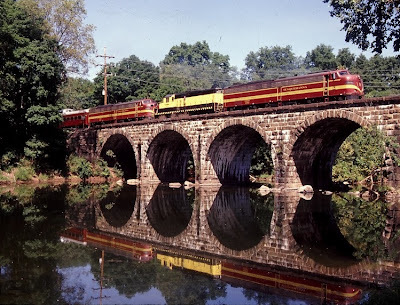 With 500 loaded coal cars and six locomotives, this five-mile train was operated by N&W in a contest with the Pennsylvania Railroad. "Today, the Kenova bridge is an integral part of the landscape - a beautiful, historic, and key part of our national rail system," Hensley said. "I see it as a link from the past to the future." Online research turned-up the following pictures of this bridge. This photo is from the Virginia Tech IMAGEBASE, Norfolk & Western Historical Photograph Collection, and it was taken in October 1938. This photo is from the BRIDGEHUNTER.COM website, and it was take by Calvin Sneed in April 2010. Following comment from the website: "Spectacular 2 Baltimore (Pratt) through trusses from south shore, 1 Pennsylvania (Petit) through truss (river channel span), 2 Baltimore (Pratt) through trusses on north shore, built in 1903-04." 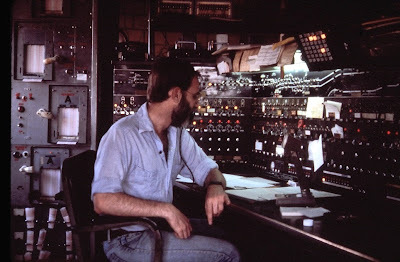 Back in the early '80s it was my good fortune to be invited up to see the inside of COLA Tower in Columbia, PA. Unfortunately I didn't record the actual date of when this photo was taken. 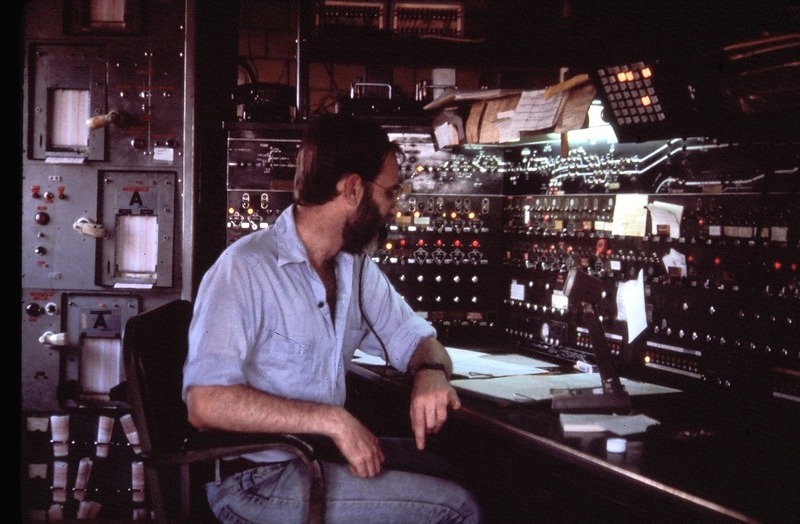 This visit proved to be both an interesting and informative with the tower's second shift operator. Cola Tower's control began at TOME, 4.5 miles from Perryville (MD), plus ten more interlockings between there and COLA, and three interlockings to the west. Those machines seen to the left in this image print out readings from hot box detectors in the field. Once the Port Road got CTC, the windows were bricked over and the tower was turned into essentially a large relay case. The blue and white "COLA" sign still looks good as it hangs on the tower's side to this day. Photo 1: Back in 1982, my father and I received an invitation to our cousin's wedding in Aurora, CO. Flying into Denver from NJ, I decided to see if I could get some photos of Denver's railroading scene by getting up early to get out before having to leave for the ceremony. 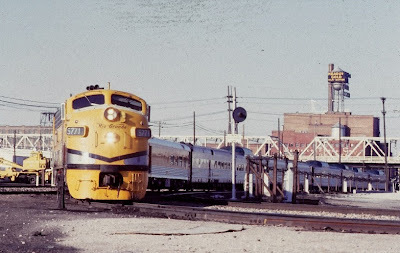 I was fortunate enough to snap this photo of the Zephyr as it departed Denver's Union Station on June 5, 1982. According to a newspaper's clipping that I have, within less than a year the Zephyr would make its final run on April 26, 1983. Photo 2: As a student attending King's College in Wilkes-Barre (PA) in 1979-80, weekends would usually find me heading over to the D&H's Hudson Yard in Plains to see if there was anything of interest to be seen. On this one Saturday, D&H 5002 was working the yard. This diesel had the distinction of being the first D&H locomotive to sport the new simplified paint scheme. 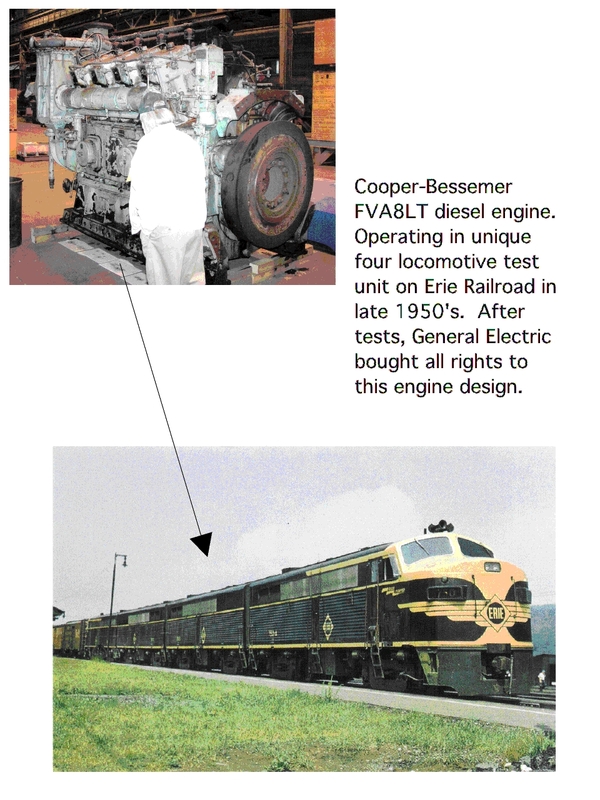 A GE Testbed #750 Cooper-Bessemer FVBL-8T Engine SURVIVES in 2013! 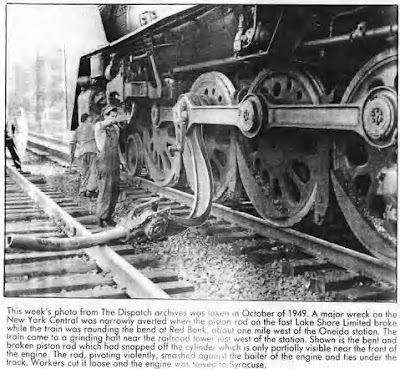 Ray Grabowski, Jr., President of the Lake Shore Railway Historical Society in North East, Pennsylvania, advises that a spectacular piece of railroad diesel-electric locomotive history, long believed lost to the scrapper's torch, was instead preserved! 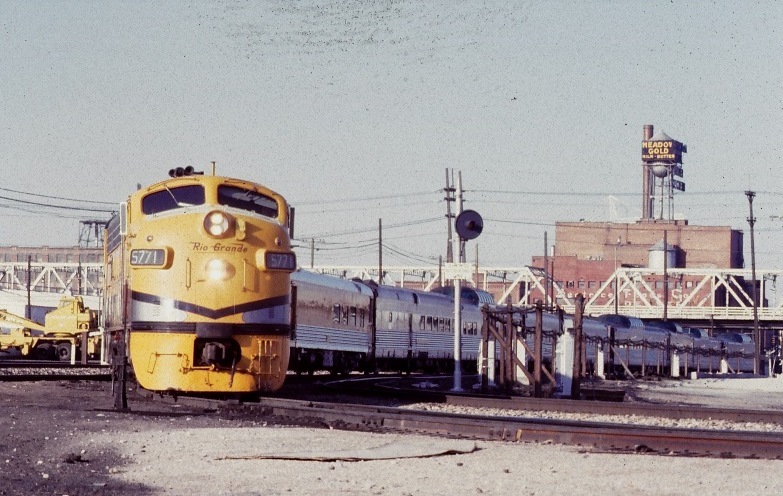 Recall the 1954 four-unit, 6,000-horsepower experimental locomotive that ran with its streamlined carbody painted black and yellow as Erie Railroad #750A-750D. 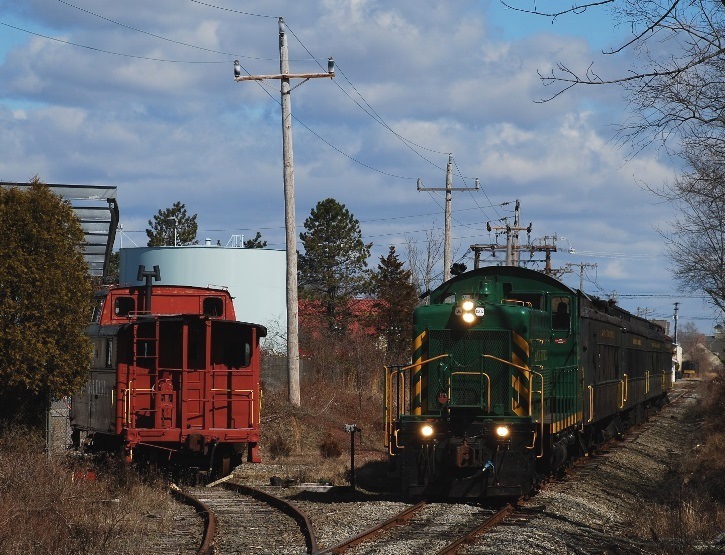 Owned by General Electric and leased to the ERIE, the Four-cycle Foursome spent half-a-decade testing in road service on the Erie. The set accumulated over one million miles of operating data that led to prime-mover and electrical refinements that culminated in the introduction of the landmark GE domestic model U25B. The Universal Series was a milestone in locomotive technology and a major step forward toward GE becoming the world's #1 locomotive manufacturer. 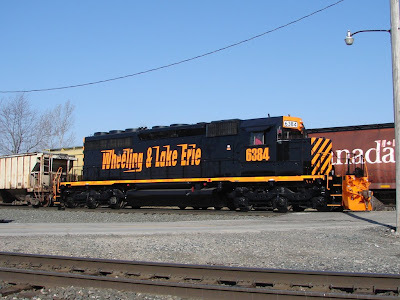 "When GE was exploring its planned move back into domestic main line diesel locomotive markets, it developed the well known 4-unit rolling testbed locomotive set that ran for some time on the Erie RR. Of course, GE's tests supported the move back into the markets and the rest is history, BUT, what is not know is the complete story of what happened to those engines. "The locos were re-powered and sold to power-hungry UP. The original prototype engines, removed from the locomotives, were subjected to further testing. One engine was sent to Cooper-Bessemer's factory in Mt. Vernon, Ohio for testing and disposal there. Welllll, it wasn't disposed of, as was reported to GE. Instead, shop forces adapted and installed it inside the Mt. Vernon plant as power for air compressors. It ran faithfully up until just a couple months before Rolls-Royce bought the C-B plant in 1996. "The gentleman in charge of plant maintenance was originally involved in the GE testbed project. He contacted Lake Shore Railway Historical Society to see if there was interest in saving this 'engine that no longer existed.' Well, again, the rest is history and the engine is in storage in a warehouse in Erie, PA, waiting to come to North East to be added to the RR Museum's collection. "What is great is showing the engine to people who 'know their engines', they will eventually say something like, 'oh, yea that's a Cooper-Bessemer...no, wait, that looks like a GE...no, maybe it IS a C-B'. I can't wait to get it to NE and on display. People just do not understand the size of a locomotive diesel engine." 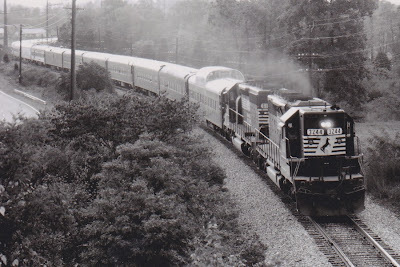 Returned to GE in 1959, the engines were all rebuilt to UM20Bs and sold to UP. One A and one B unit of the four-unit, 6,000 H.P. GE testbed #750 set had had 1,200 H.P. V-8s and the other A & B set had 1,800 H.P. V-12s. This sole survivor is a 1,200 H.P. Cooper-Bessemer FVBL-8T* engine. It is not an overstatement to observe that every brand-new 4,400 H.P. V-12 GEVO (like every GE FDL engine before them) that departs GE's Grove City, PA Diesel Engine plant headed for the Erie locomotive assembly bays can trace its lineage back 59 years to this preserved piece of iron! It absolutely is one of the Granddaddies of the modern GE locomotive era. And all those giant GEs passing the Lake Shore Museum every day on the CSXT and NS mains owe a nod to that C-B design. What a treasure! This just such a surprisingly cool and exciting revelation! That reciprocating beast should bring visitors to the museum from far and wide, likely even from overseas. Cooper-Bessemer sold the rights to General Electric in 1953 for the development of larger versions of its engines for locomotive propulsion. .
"James C. Rhoads was in charge of GE's modification and updating program on the C-B engines for their use in domestic road use from 1951 until his death in September, 1960. In 1948, Rhoads began advocating General Electric’s entry into manufacturing diesel engines for the locomotive business. 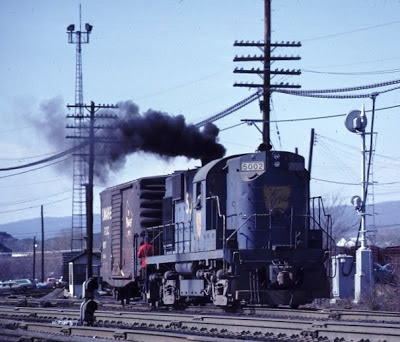 "In December 1958, Rhoads wrote a letter in response to a retired senior GE executive who had supported GE's entry into the domestic locomotive business. Rhoads's wrote: "We have been working on improving the Cooper-Bessemer engine and are running in the laboratory equivalent to 3,400 hp on a 16 cylinder engine, and we don't see that this is necessarily the end." * Historical references refer to the tested C-B diesel engines with different IDs. Might this result from GE vs. C-B designations? JACKSONVILLE, Fla. - March 4, 2013 - CSX today announced that the I-85 Site in Macon County, Ala., is the first recipient in the state to receive CSX Select Site designation. CSX introduced the program in 2012 as an opportunity to work with the economic development community to create an inventory of sites that can be marketed for CSX direct rail service. CSX has partnered with The Austin Company, a nationally known site selection consulting firm, to screen candidate sites and assist communities with the application and certification process. "This 277-acre site in Macon County is well situated along the Hyundai-Kia automotive corridor just off I-85, the Interstate connecting Montgomery and Atlanta, Ga. The site is also in close proximity to Auburn and Tuskegee Universities," said Jonathan Gemmen, senior location consultant, The Austin Company. "The cleared site is adjacent to CSX's mainline and has all utilities on or within easy access to the property." CSX would like to recognize the Macon County Economic Development Authority, Wayne and Jimmy Bassett of Beck's Turf Farm, the Utilities Board of Tuskegee, the Macon County Commission, the City of Tuskegee and City of Notasulga, as well as the unwavering support of the legislative delegation of State Rep. Pebblin Warren and State Senator Billy Beasley. CSX has certified numerous other sites across its service territory. The CSX Select Site program is in addition to its existing Megasite Program, which focuses on sites of 1,000 acres or more, including the South Alabama Megasite in Baldwin County. The certified sites are also featured on our user-friendly Web portal. To learn more, visit http://www.csxselectsite.com. The Easter Bunny Train JUST 3 WEEKS AWAY! Your ride will wind along the scenic Delaware River leaving from the Historic District of Phillipsburg, New Jersey. The train will travel along the river to Carpentersville and our destination will be the site of the historic Lime Kilns. In front of the 150 year old Lime kilns is a beautiful little glade filled with Easter Eggs! Once we arrive you can get off the train, take a picture with Mr. Bunny and gather 4 Easter eggs filled with little toys ( similar to what you find in cracker jack). March 23, March 24, and March 30. JACKSONVILLE, Fla. - February 28, 2013 - CSX Corporation (NYSE: CSX) today announced that the company won a U.S. Environmental Protection Agency (EPA) 2013 Climate Leadership Award in the Goal Achievement category. The award recognizes CSX's 8 percent voluntary reduction of greenhouse gas (GHG) emissions intensity since 2007. "Reducing CSX's emissions intensity by enhancing fuel efficiency is important to CSX's mission and benefits our customers, employees, neighboring communities and investors," said Michael J. Ward, chairman, president and CEO. "CSX remains committed to driving further improvements for our environment, while at the same time moving the goods our country needs." CSX was the first transportation company to become a Climate Leaders Program Partner in March 2007 and reached its voluntary 8 percent greenhouse gas emissions intensity goal in 2010, one year ahead of schedule. By meeting this goal, CSX reduced greenhouse gas emissions by 1.5 million metric tons - the equivalent of taking 296,000 cars off the road for one year, or consuming more than 3.5 million fewer barrels of oil. In 2012, the company announced a goal to further reduce GHG emissions intensity, committing to an additional 6 to 8 percent decrease by 2020. - New, more fuel efficient, line-of-road locomotives, as well as ultra-low emission GenSet switching locomotives. GenSet locomotives employ a set of smaller engines rather than a single large locomotive engine to scale power to demand more efficiently and reduce GHG emissions and diesel fuel consumption by up to 25 percent. "I commend CSX for its exemplary commitment and dedication to tackling the challenge of climate change," said Gina McCarthy, assistant administrator for EPA's Office of Air and Radiation. "CSX and all our Climate Leadership Award winners are reducing harmful carbon pollution, increasing efficiency and cutting waste at the same time." The EPA co-sponsors the Climate Leadership Awards with The Climate Registry, the Center for Climate and Energy Solutions, and the Association of Climate Change Officers. The Climate Leadership Awards build on the voluntary work that organizations pursue in reducing greenhouse gas emissions and publicly recognizes those efforts. 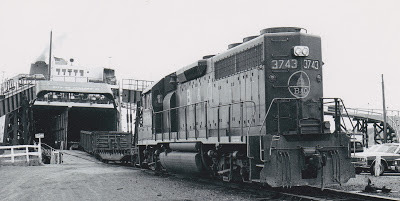 The date is July 7, 1983 as I watch B&O 3743 (GP40) unload some of the twenty-three cars that the City of Midland car-ferry has just ferried across Lake Michigan. They are being off loaded in Ludington, Michigan. This was day twenty-six of a fifty-six day bicycle trip that started in Flemington, NJ and terminated in Gillette, Wyoming that I was on.